Based in South Florida, City Life Investigations, Inc. is a licensed and insured full-service agency for all your investigative needs. 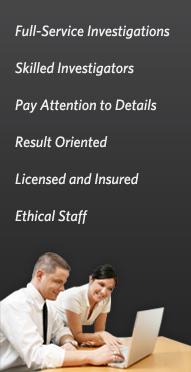 Your case will be staffed with experienced and qualified investigators and experts. You will receive the finest quality service, personal attention and the most cost-effective performance available while maintaining your highest expectations. Whether your case is large or small, in Miami or beyond, we develop a strategy that meets all of your needs. Working closely with you, we ensure that the investigation process is thoroughly planned and carefully coordinated. Then we deliver top-quality services and results that are within your budget, and on schedule. Our clientele consist of a small group of selected attorneys, companies within the insurance & fraud industry as well as private citizens. We rarely advertise. Therefore, our success is based on your satisfaction and referral. Remember, we earn your business the old-fashioned way, through hard work and dedication. Contact us today!